The Brooklyn Book Festival is an annual book fair held in the fall in Brooklyn, New York. It was begun in 2006 by Brooklyn Borough President Marty Markowitz, co-producers Liz Koch and Carolyn Greer who wanted to showcase the "Brooklyn voice" in literature, as numerous authors reside in the borough. However, in subsequent years the fair has expanded its scope and hosted many non-Brooklyn and international writers, including Joan Didion, Dennis Lehane, John Reed, Rosanne Cash, Salman Rushdie, Karl Ove Knausgård and Dave Eggers. 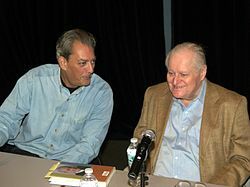 Paul Auster and John Ashbery discuss their work at the 2010 festival. New York City, Brooklyn, New York, U.S. In 2009, attendance reached 30,000. Also in 2009, St. Francis College established a biannual Literary Prize worth US$50,000 to support a mid-career writer. The winner of the prize is announced by a panel of authors during the Brooklyn Book Festival every other year in September. The festival includes themed readings, panel discussions, vendors, and author signings. In recent years, the Book Festival has expanded to include a Children's Day and Bookends, literary-themed events like book readings, parties, stand-up shows and performances in various public venues in Brooklyn. ^ Smith, Dinitia (September 15, 2006). "The Brooklyn Book Festival A Literary Voice With a Pronounced Brooklyn Accent". The New York Times. ^ "About — Brooklyn Book Festival". Brooklyn Book Festival. Retrieved September 7, 2017. ^ Smith, Dinita (September 15, 2006). "A Literary Voice With a Pronounced Brooklyn Accent". The New York Times. ^ Lazarowitz, Elizabeth (June 3, 2010). "Joyce Carol Oates, Pulitzer Prize winner Paul Harding bound to show up at Brooklyn book fest". Daily News (New York). ^ Rosen, Judith (September 3, 2010). "Brooklyn Book Festival to Take Place September 12". Publishers Weekly. ^ "SFC Literary Prize". www.sfc.edu. 2009. Retrieved July 8, 2010. ^ "Home" Archived September 23, 2011, at the Wayback Machine Brooklyn Book Festival Official Site. (New York). Retrieved August 23, 2015. ^ "Children's Day Events Archive — Brooklyn Book Festival". Brooklyn Book Festival. Retrieved September 7, 2017. ^ "Bookend Events Archive — Brooklyn Book Festival". Brooklyn Book Festival. Retrieved September 7, 2017. Wikimedia Commons has media related to Brooklyn Book Festival.